New Mexico, Oregon, Utah, Washington, Wyoming, Islands of the Pacific). 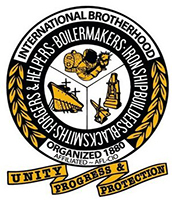 This is an exciting opportunity to help workers by becoming a union organizer with the International Brotherhood of Boilermakers. The International Brotherhood of Boilermakers, Iron Ship Builders, Blacksmiths, Forgers & Helpers, AFL-CIO/CLC, represents members across North America employed in industrial construction and maintenance, shipbuilding, cement making, railroads, manufacturing and allied industries. Organized in 1880, we are headquartered in Kansas City, Kan. We are a diverse union, with members engaged across a range of industries, from energy to mining to commercial and naval shipbuilding to consumer products. The Boilermakers’ family of organizations includes Bank of Labor, the MOST trust (with 17 industry-leading programs for safety, training and work readiness), the Boilermakers National Apprenticeship Program and the Boilermakers National Funds. Organizers will assist workers with forming unions in their workplaces and recruiting non-union workers to join the union ranks. These positions require very dedicated individuals who are willing to frequently work irregular hours, including nights and weekends. Organizers also need to be able to travel basically on-demand and be willing to stay on assignments as long as needed to build and successfully complete an organizing campaign. Union organizing can be an extremely rewarding career because you are helping workers obtain justice in their workplaces, improve their wages, and improve their working conditions; however, the work can also be extremely challenging and demanding at times. Significant travel is required. Graduate Boilermaker apprentices who are interested in this position and meet the qualifications set forth below are strongly encouraged to apply. Bilingual and multilingual candidates are preferred. Candidates who speak and write in the English language and one or more of the following languages could be very helpful: Spanish, Ukrainian, and/or Russian. Competitive salary commensurate with experience will be offered to successful candidates. Although candidates with at least some experience is preferred, entry-level candidates may apply and will be given consideration if they can successfully demonstrate they have skills and/or experiences that would allow them to become a successful union organizer. Our organization is an equal opportunity employer that actively seeks to build diversity. Women, people of color, LGBTQ, Veteran, and disabled individuals are fully respected and encouraged to apply.